"And all I ask is a tall ship and a star to steer her by"
I have to agree with Al Placette when he said this is "one of the most beautiful and oft-quoted lines ever penned about sailing and the sea..."
If you have this extreme nostalgic feeling for this ancient art of navigation using the stars and the planets rather than a GPS, then you are not alone. At least I would be another one you can count on to share that feeling. Every time that I got to sail on a 14' dinghy or a 40' yacht, I felt that same feeling as if there was the wind of thousands years of sea going history blowing on my back. I imagined of all the courage, tragedy and triumph that people must had felt as they got lost on the high sea or able to make it to the destination. This app is created out of a deep admiration for these ancient mariners. It is with the hope that it could help to do a little part in preserving this beautiful art of navigation, and may be, bringing us all a little bit closer to those courageous sea goers centuries before us. The main function of this app is to help you calculate the most likely position given a series of star sighting. The resulting position is mapped in terms of latitude and longitude so that you may be able to find out where you are approximately. To help users who are familiar with line of position (LOP) intercept method, the plotting of the intercept lines (I) and LOP lines is provided. Please note that StarStruck's algorithm for determining the lost likely position is a bit more computationally involved than the simple LOP method so the result should be a bit better than that of the LOP method. In order to help you to identify the visible stars for sight recording, a star map is available should you need it. If you are not familiar with a star map, it is used to display the altitude of the star and the azimuth from true north. The large circle around the stars represents the lowest point in the sky, which we call the horizon, and the center of the circle represents the highest point in the sky. This point is overhead of you and is also called the zenith. You are encouraged to learn how to read a sky map because it really helps you identify the stars and familiarize yourself with the night sky. The sky map is a tried and true method and it is as widely used today as by many generations before us in history. Star map: the largest circle represents the horizon, the center of the circle represents the zenith. True north is at the top of the circle. Stars with higher brightness level are shown more whitish in color. Stars with lower brightness level are darker in color. If you are already familiar with sextant navigation then continue with the reading, otherwise you can read the background section on celestial navigation to familiar yourself with the concept. 2. Star name: SUN, MOON, Polaris, Sirius, Altair, etc. The app allows you to enter all this information and it calculates the most likely position for you. 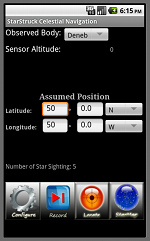 Since most of us may not have a sextant, I have tried to make use of the available sensors on most smart phones to help measure the altitude of the star by simply point the device to it. The sensor accuracy is within 1 degree so it is not as accurate as a good sextant but if you do several star sightings , then the error will average out and you will get a good fix of your position. 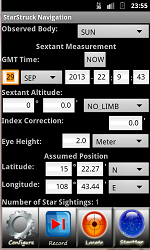 To use the integrated sensor for altitude measurement, click on Configure button and check on "Use Device as Sextant". For aiming purpose, I place the phone on top of a straw and look through the straw to see the star. When the star appears in the view then I press either the track ball or the volume control buttons to have its altitude recorded. Please note that when you are aiming at the SUN, make sure that you wear adequate shade protection for your eyes else the sun's radiation could result in permanent damage to your retina. Alternatively, you may be able to look at the shadow of your phone and try to minimize it while lining it up with the sun. This way you do not have to look at the sun directly. When you start the app for the first time, the sensor altitude measurement is on by default unless you change it to manual sextant input by using the configure button. 1. Bring the sextant to your eye and move the index arm of the sextant until you see two suns—on reflected on the liquid and a double reflected image on the mirrors. 2. Line the two suns up by continuing to move the index arm. Now the angle that you read out from the sextant is then exactly twice that of the sun's altitude. When you enter the sextant angle into StarStruck Navigation, it will take care of halving it for you. The height of eye is set to zero so there is no dip correction. Here are the main control buttons. Set user preferences. Use this button when you want to enable the device to be used as altitude measuring equipment. If not then you will be asked to enter the sextant measurement manually. You also use the configure button when you want to clear the star sights stored in memory and start all over again for a new estimated position. Start to record a star sight. The same function can be activated by pressing on the volume control buttons, or the track ball if your phone has one. Every recorded star sight will be saved in memory. You will need to record at least two star sights before you can get a fix on your location. The more star sights you record, the more accurate the calculation will be. Calculate your most likely position based on at least two or more recorded star sighting. You would use this button after you have already recorded two or more star sightings. Show the map of all visible stars as seen from the most likely location of your phone or from a manually entered location . You can change the star map location setting using the star map menu (Starmap screen > Menu > SetLocation). By default star map uses the current time on your phone but you can also change it to another time that you prefer (Starmap screen > Menu > SetTime). To see the listing of all the stars's altitude, azimuth, GHA, declination you can use the star map menu (Starmap screen > Menu > Display Star Data). Note: if you are using the integrated sensor as a sextant then it is assumed that you are aiming for the center of the observed body. Therefore, the limb setting will always be set to "NO LIMB ". Note 1: By default, StarStruck displays the starmap with the star's azimuth increasing clockwise. Some users may prefer the stars to be displayed counter clockwise instead. Note 2: By default, StarStruck will try to detect your GMT offset automatically based on the phone information. Some user from region of the world where the GMT offset is fractional had asked for a manual GMT offset setting to override the auto detect setting. You can overwrite 'AutoDetect' GMT setting with your own local GMT offset like this, e.g. +5 or +1.5 or -4, etc. 1. LOP editing: allows the user to review all the LOP data captured from all the star sights recorded. The user would be able to delete the LOP or edit it to account for ship movement. You can review the LOP information about any star sight in memory using LOP Editing (accessible via Menu > LOP). 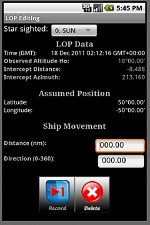 Modification to the LOP based on ship movement can be added via the ship movement data input dialog and Record button. One can also delete an LOP via Deletebutton. 2. Trip editing: This feature is accessible via Menu > TRIP. A user can organize all the star sight records into groups for each trip. That is, a user may have many trips and each trip may have many groups of star sighting records. Normally a group would corresponds to a geographical location that the user is trying to ascertain its coordinate. A trip may contain one or more groups of star sightings. 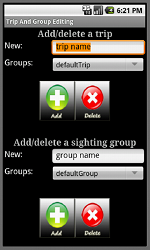 Trip editing allows for the addition/removal of a trip and for the addition/removal of a group(s) within a trip. You can set the active trip and group to work with using the Config button. Trip and group may be confusing for some user so let do an example. Said if you are going to go from NewYork to Sydney, Australia, then at the beginning of the trip you would go into Menu > Edit Trip and add a trip called NewYorkToSydney. Then, as you travel along the way and you want to find out the locations of your ship over time, let say location #1 to location #10. To determine each of the ship's locations you would have to take two or more star sightings per location. Each group of sightings per location is what the app refered to as a group. In this example you would have to create 10 groups to hold the sighting for your 10 locations. In summary, you created one trip called NewYorkToSydney, and 10 groups to hold the star sighting for this trip. Note that using trip and groups allows you to organize and save your sightings so that you may review them at a later time. If you have no interest in saving the star sightings then there is no need to bother with creating trip and groups, especially if it causes you confusion. By default StarStruck saves every sighting to the group named "defaultGroup" under the trip named "defaultTrip" . If you don't plan to go on any trip and save many sightings along the way then there is no need to add any more trips or groups. The default should be just fine. 3. Offline map: our app supports offline map which is helpful when the Internet is not available. Since offline map of the whole world is very large, the app includes only a very high level offline world map in order to keep the application small in size. However, a user who has a device with large enough external storage can download the map on his own time to support offline navigation. 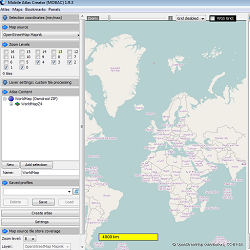 In order to download the offline maps for your needs, first install the application Mobile Atlas Creator (MOBAC) on your PC. This is a freely available program available over the net ( http://mobac.sourceforge.net). The program allows you to define a map area, a map source (choose OpenStreetMap mapnik) and an atlas format (choose osmdroid ZIP ). Then you can download the map zip file and place it on your sdcard under the directory /sdcard/osmdroid. There after even if you don't have the Internet, StarStruck will still be able to display the map for you. To improve the speed of the map display you may want to unzip the map file to /sdcard/osmdroid instead so that StarStruck doesn't have to spend the effort in unzip it every time a map is needed. 4. Meridian passage, rise and set time: This feature is accessible via Menu > Meridian. As it happened quite often a user would want to know what time the Sun or Moon would pass over head (meridian passage) or when it rises or set at his location for different reasons. This feature provides for a quick look up of this information. 5. 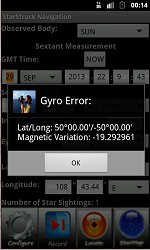 Magnetic variation: This feature is accessible via Menu > GyroError. Knowing the magnetic variation of the compass allows the user to correct the compass reading to find true north. Since the difference between true north and the magnetic compass is the magnetic variation, one just need to add the magnetic variation to the compass reading to find the true north. "Professional sextants use a click-stop degree measure and a worm adjustment that reads to a "Minute of arc", 1/60 of a degree. Most sextants also include a vernier on the worm dial that reads to 0.2 minute. Since 1 minute of error is about a nautical mile, the best possible accuracy of celestial navigation is about 0.1 nautical miles (200 m). At sea, results within several nautical miles, well within visual range, are acceptable. A highly-skilled and experienced navigator can determine position to an accuracy of about 0.25-nautical-mile (460 m)." Rather than writing a complex mathematical tutorial on celestial navigation and perhaps turn away 90% of the users permanently, let me start by saying that celestial navigation is another way of determining your position on earth by using the stars as your light houses . Please note that I am using the term star loosely here to mean the Sun, the Moon and the planets as well. Most of us are familiar with the concept of the light house as it is a mean to help people at sea to determine their position and find their way to a safe port. By keeping track of light houses along your route on a map and follow them, one should be able to get to his destination without much trouble. Now let's suppose that someone has given you a map of exactly what stars are visible in the sky for any location on earth. Then, for sure you should be able to look up in the sky and compare the visible stars to your map and figure out your approximate location, wouldn't you? In the past, the map of the stars in the sky is contained in huge volumes of scary books called the Nautical Almanac. Different volumes also have strange names like HO 229 or HO 246. Learning how to use these books really took the fun out of celestial navigation and reduced it to just a laborious boring work that is susceptible to human errors and frustration. Sure, in the old day it was a good idea to keep this science a secret so that only the captain and his first mate knew how to navigate the ship, rendering any thought of mutiny among the crews unthinkable. But today there is no need for such a secret and we want to make it easy so that more people can learn to appreciate celestial navigation. Otherwise, this beautiful ancient art would not be able to prosper. A navigator who was armed with these scary books would use his sextant to measure the altitudes of different stars (this is call star sighting). He also records the time for each sighting. Using the recorded observation times and altitudes, he would be able to look up in the big books to find out approximately how far he is from an arbitrarily assumed position. Since I have suffered through this process before, I tried to create this application to do away with all these books and their table look up. 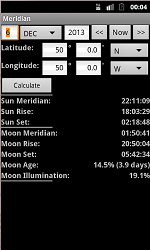 When you are using this Celestial Navigation application, all the tables look up and calculations are done for you automatically. All that you have to do is to enter the sighting time, the star altitude and your assumed position. The software takes care of the rest and gives you your approximate location at the end. 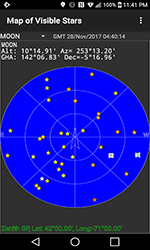 For those who are technically inclined, I would recommend the reading of "Celestial navigation for dummies" by onboardintelligence.com. I think any discussion about celestial navigation wouldn't be completed without mentioning a little bit about the history of the sextant and our good old watch. These are two key devices without which celestial navigation cannot work. I hope that you will find it as fascinating as I do. The sextant probably has a history as old as when the first human being began using the stars for his navigation. That is to say we don't really know exactly when it all began. One thing that we knew is that as early as a thousand years ago, people had been using the altitude measurement of Polaris for getting back to their home ports. To begin, the sailor would record the altitude of Polaris at his home port. Then, to return after a long voyage, he needed only to sail north or south, as appropriate, to bring Polaris to the altitude of the home port, then turn left or right as appropriate and "sail down the latitude," keeping Polaris at a constant angle. The Arabs knew this technique well and they introduced two important instruments that helped to measure the altitude of the stars - the quadrant and the astrolabe. Astronomers Astrolabe. Arabic astronomer's astrolabe was used to find the time of rising and setting of the sun and the altitude of the sun and selected stars. Importantly, it was used to find the direction of Mecca for the devout Moslem's morning and evening prayers. In the word "astrolabe" - "astro means 'star' and "lade" roughly translates as 'to take' or 'to find'. In order to use the astrolabe, the navigator would hold the instrument by the ring at the top. This caused the instrument to remain in a vertical plane. He would align the plane of the astrolabe to the direction of the object of interest. The alidade was aligned to point at the object and the altitude was read off the outer degree scale. The problem with the astrolabe was that it has to be suspended vertically for angle measurement. This was okay on land but on a ship in a rough sea this became a problem. DIY Astrolabe. You can build an astrolabe like this. This one is made out of a bottom of a plastic barrel, a paper protractor, a camera tripod, a straw and some metal pieces. I used to track the Sun around my home with this one. It was great fun. Similar to the astrolabe, the mariner's quadrant - a quarter of a circle made of wood or brass came into widespread use for navigation around 1450, though its use can be traced back at least to the 1200s. The quadrant is simpler than the astrolabe in that it is only quarter of the astrolabe in size; however it shares the same limitation of the astrolabe that it cannot be used on windy water. Mariner's brass quadrant. The scale spans 90 degrees and is divided into whole degrees. A plumb bob establishes a vertical line of reference. The quadrant shown here is a replica of the type Columbus might have used on his voyages to the New World. During the 1400's, Portuguese explorers were traveling south along the coast of Africa searching for a route to the orient. As a seafarer nears the equator heading south, Polaris disappears below the horizon. So, in southern seas, mariners had to have a different way of finding their latitude. Under orders from the Portuguese Prince Henry, The Navigator, by 1480, Portuguese astronomers had figured out how to determine latitude using the position of the sun as it moved north and south of the equator with the seasons, what we now call its "declination." In simple terms, the navigator could determine his latitude by using his quadrant to take the altitude of the sun as it came to its greatest altitude at local apparent noon, and then making a simple correction for the position of the sun north or south of the equator according to the date. The next step in the evolution of celestial navigation instruments was the cross-staff, a device resembling a Christian cross. The cross-staff is made up of two pieces - the vertical piece, the transom or limb, slides along the staff so that the star can be sighted over the upper edge of the transom while the horizon is aligned with the bottom edge. A cross-staff. This one is a modern reproduction in the style popular with Dutch navigators in the eighteenth century. The navigator places one end of the main staff against his cheek just below his eye. He sights the horizon at the end of the lower part of the transom, adjusting the cross arm on the main arm until he or she can sight the sun at the other end of the transom. The altitude can then be determined by reading the position of the transom on the scale on the main staff. This value was converted to an angular measurement by looking up the value in a table. A cross-staff in use This drawing, from a Spanish book on navigation published in 1552, shows how the cross-staff was used to determine the altitude of Polaris. If you've ever heard the phrase "shooting the stars," it comes from the practice of holding a cross-staff up to the user's eye with one hand, with the transom grasped in the other hand so that the person looks like an archer taking aim at the sun. The major problem with the cross-staff was that the observer had to look in two directions at once - along the bottom of the transom to the horizon and along the top of the transom to the sun or the star. Again, not an easy feast on a rolling deck! Davis quadrant. Made by an English craftsman named Walter Henshaw in 1711. It's made of rosewood with a diagonal scale on boxwood. The backstaff or back-quadrant is another evolution in the design of celestial altitude measurement instrument, in particular the altitude of the sun. When observing the sun, users kept the sun to their back (hence the name) and observed the shadow cast by the upper vane on a horizon vane. It was invented by the English navigator John Davis that described it in his book Seaman's Secrets in 1594. It was called a quadrant because it could measure up to 90 degrees, that is, a quarter of a circle. The observer determined the altitude of the sun by observing its shadow while simultaneously sighting the horizon. Relatively inexpensive and sturdy, with a proven track record, Davis quadrants remained popular for more than 150 years; even after much more sophisticated instruments using double-reflection optics were invented. One of the major advantages of the Davis back-staff over the cross-staff was that the navigator had to look in only one direction to take the sight - through the slit in the horizon vane to the horizon while simultaneously aligning the shadow of the shadow vane with the slit in the horizon vane. The majorproblem with back-sight instruments was that it was difficult if not impossible to sight the moon, the planets or the stars. Thus, toward the end of the 1600's and into the 1700's, the more inventive instrument makers were shifting their focus to optical systems based on mirrors and prisms that could be used to observe the nighttime celestial bodies. The critical development was made independently and almost simultaneously by John Hadley in England and by Thomas Godfrey, a Philadelphia glazier, about 1731. The fundamental idea is to use of two mirrors to make a doubly reflecting instrument - the forerunner of the modern sextant . In order to use a sextant, one would hold the instrument vertically and point it toward the celestial body. Sight the horizon through an unsilvered portion of the horizon mirror. Adjust the index arm until the image of the sun or star, which has been reflected first by the index mirror and second by the silvered portion of the horizon mirror, appears to rest on the horizon. The altitude of the heavenly body can be read from the scale on the arc of the instrument's frame. A very nice looking modern sextant. To navigate, seafarers could determine their latitude by using a sextant to observe the position of the sun at midday or bright stars at night. And, by tossing a weighted rope off the ship and counting how many knots passed through one's hands in a given period of time, a rough estimate of speed could be obtained. But it's of limited value to know that you're traveling southeast at 7 knots, 50 degree north of the equator, if you have no idea whether you're closer to Newfoundland or Ireland. That is, what longitude are you on? The key, as everyone realized, was being able to tell what time it is both at one's current location and at some other reference point on the planet (say, Greenwich). Because the speed of the planett's rotation is known (about 15 degree per hour), if you know what time it is at a given longitude relative to Greenwich, you can do some simple math, and end up with your position. Unfortunately, it wasn't easy to design an accurate clock. That is, at least in the 15th and 16th centuries. The pendulum clocks at the time was no good in the rocking sea. They were insufficiently accurate to navigate with any certainty, and this all too often led to disaster. There being no apparent solution to the problem, mariners simply lived with this frustration. But on a foggy day in 1707, four large British warships returning from France misjudged their longitude and ran aground on the Scilly Islands off the southwest tip of England. The ships all sank and more than 2,000 men died. As a result, in 1714, the British government offered a huge cash prize (20,000 British pound - equivalent to millions of pounds or dollars in today's money) to the first person who could devise a way of accurately measuring longitude at sea. To win the prize the person must contrive a means of resolving position at sea to within 30 nautical miles after sailing to the West Indies. This required a clock that could keep time to within 3 seconds per day. For half a century, all manner of charlatans and pseudo-scientific crackpots tried to claim the prize, but none could solve the fundamental scientific problem of determining longitude at sea. During this time, John Harrison (1693-1776), a woodworker and musician from Lincolnshire, devoted his life and genius to solving the problem. Through intuition and sheer effort he developed a clock, a maritime chronometer that kept time accurate to one second per day. Harrison's chronometer was a great advance for maritime navigation overcoming the harsh environmental conditions encountered at sea. Using a copy of Harrison's clock, Captain James Cook mapped the Polynesian islands and the Pacific Ocean regions. He wrote in his log book great praise for the new navigational instrument, "our trusty friend the watch" and "our never failing guide." It is a shame that the skeptical British Board of Longitude, made up of petty astronomers who had no interest on how a clock works, kept denying Harrison his prize until he was in his eighty. Nevertheless, it was still better late than never. Over time, clocks have improved dramatically and needs have changed, so GMT has evolved to UTC. The acronym UTC is an English-French mixture for Coordinated Universal Time. UTC is based on a definition of the second that is nearly a million times more accurate. Under the general umbrella of la Convention du Metre, this new second is based on a quantum resonance within a cesium atom. It is interesting to note that with today technology our time keeping precision has improved tremendously. The current best accuracy for the determination of the second, as announced by the US in 2014 - the NIST-F2 clock, results in a time error of only plus/minus 1 second every 300 million years. While this is so much more accurate than Harisson's chronometer, we shall always pay tribute to the first man who had lifted the art of navigation to another level of precision which was so critically needed. In order to help identify the stars in the night sky, people have been relying on prominent objects of the night sky (e.g., the Big Dipper, the Orion and the Southern Cross) to help them quickly identify the nearby constellations and stars. This method of star identification is helpful to both the beginners as well as the experts as our night sky can be very complex and one can easily forget how things are heavenly arranged. Hopefully, this small write up can help someone to get a handle on the night sky. The Big Dipper is a prominent group of stars in the northern sky and is very readily recognizable. It looks like a bowl with an arching handle. It is circumpolar (never setting below the horizon) and therefore visible in northern skies year-round. If you can find the Big Dipper in the sky, you have a starting point for identifying many other stars. As you can see from the diagram, numerous other stars can be found based on the position of the Big Dipper. Let us see how we can identify a few of these stars. 1. "The Pointers" - The two stars forming the pouring edge of the Big Dipper's bowl (on the side away from the handle) point to Polaris, the north star, in the constellation Ursa Minor. Polaris is a rather faint star about five times farther away than the distance between the pointers themselves. Note 1: No matter where you are in the northern hemisphere, when you face Polaris you will be facing north. Note 2: Polaris marks north more accurately than a magnetic compass. Note 3: The angle between your horizon and Polaris is equal to your latitude on earth. 2. If you continue on this line from the Pointers on past Polaris, at an equal distance opposite the Big Dipper, you will intersect Cassiopeia. 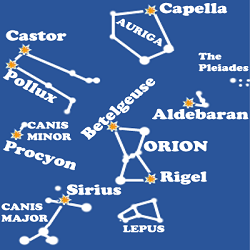 Cassiopeia is a W-shaped constellation that is home to the stars Calph and Shedir. 3. 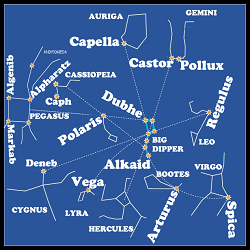 Trace a line from the Pointers of the Big Dipper to Polaris and past Cassiopeia, and you will come to a large, nearly perfect square of four stars called the Great Square of Pegasus. 4. "Follow the Arc to Arcturus" - Follow the curve of the Big Dipper's handle away from the bowl to the fourth brightest star in the sky, Arcturus, of the ancient constellation Bootes. 5. "And Speed on to Spica" - If you extend the curve by another Dipper length from Arcturus then you will meet Spica that is in the large zodiac constellation Virgo. After the Big Dipper, Orion is ranked as the most distinctive group of stars in the heavens. Rigel is the brightest star in Orion followed by Betelgeuse. The three stars in the middle of Orion form a "belt" of the Orion constellation. 1. If a line is formed by the Orion's belt is extended 20 degrees down to the left then you will find Sirius, the brightest star in the night sky. Note: if you hold your fist at arm length then it is approximately equal 10 degrees, so 20 degrees would be two fists at arm length. On the other hand, 1 degree is about the size of your little finger held at arm length. This is an useful fact to know as it helps you to measure the stars' relative locations when a more precise measuring instrument is not available. 2. For an equal distance (20 degree) in the opposite direction, the Orion belt points to Aldebaran, the first-magnitude yellowish orange star. Then, if this pointer is extended another 15 degree then you would meet the beautiful cluster of stars known as the seven sisters - the Plaeiades. 3. If a line from the middle of the belt, passes the middle of Betelgeuse and Bellatrix, and extends for another 45 degrees from there then you will meet constellation Auriga. It is home to the star Capella - the second brightest star of the night just behind Sirius. 4. If you trace a large curve from Capella to Sirius on the left of Orion then you would meet three other bright stars of the night: Castor, Pollux and Procyon. To find the stars in the southern sky, one usually try to locate the Southern Cross first and use it as the anchor point. Although the Southern Cross is small and not as prominent as another constellation like Centaurus, it is distinctive enough to serve as a constant point of reference. 1. 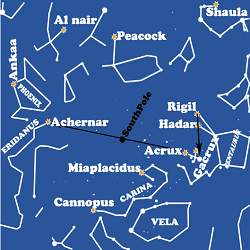 To locate the Southern Cross, you would trace a line that passes through Rigil Kentaurus and Hadar of the constellation Centaurus to Gacrux where Gacrux is the star at the top of the cross. 2. Once identified, the Southern Cross can be used to locate the South Pole which is the pivot point around which all the stars orbit in the southern sky. To find the South Pole, one draw a straight line between Acrux and Achernar. Then, bisect the line. The mid point of this line is approximately the South Pole. 3. The Carina constellation, known as the keel, can be located on the lower left side of the Southern Cross. Carina is the home of the stars Cannopus and Miaplacidus. 4. The Phoenix constellation, home to the star Ankaa, can be found by extending the line from the Southern Cross through Achernar. Phoenix is just about 5 degrees from Achernar. Please note that although the stars do not change in their positions, because our earth is constantly spinning and orbiting, we see the stars "move" from time to time as we look up toward the sky (it is like when we are inside a moving car and looking out the window, we see that all the buildings around us "move" backward). Our maps of stars constantly rotate and move higher or lower in the sky from one season to the next. What is important for us to remember is that the relative positions of the constellations and stars do not change; therefore, we can always use our star maps for guidance even if the stars appear to move. The Beaufort wind scale is a simple mean for sailors to relate the observed sea or land conditions to the speed of the wind. I cannot help but to include it here because of its usefulness in predicting the wind speed but also because of its ultra beautiful simplistic use of words to describe each wind speed. There had never been a more succinct, almost poetic like description of the wind as that the Beaufort scale. If you like, there is a whole book written about it called "Defining the Wind: The Beaufort Scale and How a 19th-Century Admiral Turned Science into Poetry" where Scott Huler wrote a wonderful account of its eccentric creator, Sir Francis Beaufort and how the scale was derived. I hope that you see its beauty and usefulness as well after reading it. Direction shown by smoke drift but not by wind vanes. Wind felt on face; leaves rustle; wind vane moved by wind. Wind vanes begin to move. Leaves and small twigs in constant motion; light flags extended. Raises dust and loose paper; small branches moved. Twigs break off trees; generally impedes progress. Slight structural damage (chimney pots and slates removed). Seldom experienced inland; trees uprooted; considerable structural damage. Very rarely experienced; accompanied by widespread damage. 1. Casio G-Shock watch ($80): this watch is excellent, it is water resistant and shock resistant. It doesn't need a battery (it uses solar power). Its time is always adjusted to the referenced atomic clock signal daily and it can display the time in GMT so you don't have to do any conversion. 2. Davis Mark 25 sextant ($200): this is an inexpensive sextant yet its accuracy is up to 2/10 minute of arc. Many seasoned navigators have recommended this sextant for its accuracy and durability. Thank you for using StarStruck Navigation. I appreciate any donation to help fund this work and keep the price affordable for everyone. Thank you.